TAI Robotic Review, SCAM TAI Robot Exposed With Proof! Binary Scam Alerts » Scam Reviews » TAI Robotic Review, SCAM TAI Robot Exposed With Proof! 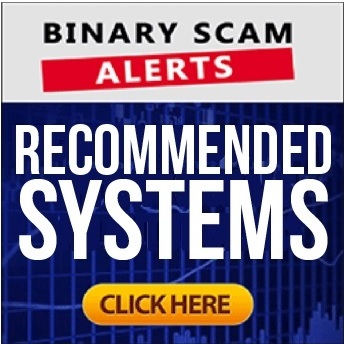 The TAI Robotic Forex indicator Software by “John Doe” and Alex Knect is a Blacklisted SCAM, and our factual and detailed review and investigation will expose the liars and crooks behind this fake Forex robot. We have already received a fresh flurry of complaints in regards to this new scheme, and it appears a rogue network of affiliate marketers are peddling this piece of trash code. This new bogus app is primarily being promoted online via SPAM email marketing and annoying popups, so make sure to unsubscribe from receiving further communication immediately and refrain from clicking on any links. We have it from a trusted source that viruses are have been downloaded and injected on computers and mobile devices after links have been clicked. Additionally, we have learned that TAI Robotic is associated with cyber crooks who are really professional con artists specializing in identity theft, credit card fraud, and internet baiting tactics. Innocent victims have been lured into this trap and illegally solicited to sign up with unlicensed offshore brokers. It goes without saying that this fraudulent software will surely steal your money and we will provide all the proof and evidence required in order to validate our claims. So if for some reason you have been led to believe this app is legit or genuine, you had best be prepared to have your wallet fleeced by expert con men. Keep reading to see how we exposed this thieving software and why we believe TAI Robotic is a confirmed financial scam. Below you will see a picture of “Alex Knect” lying through his teeth about how much money you can make using the TAI Robotic automated trading software. Right next to it you will see the same actor spewing the same lies about a sinister scam named the Azure Method which we blacklisted a while ago, only there he is holding a fake check and his name is “Paul Carr”. This is what we refer to as a “smoking gun”, and it should be enough to get you to understand what you are dealing with here. TAI Robotic Trend Indicator Software Review – Ground Breaking Software? Knect is then interviewed and claims that he is a top programmer for self-driving cars. He says he works in Germany for the market leader in the automobile industry. He states his work is to “create software that uses deep learning and sensor fusion”. With the use of NVIDIA they were able to utilize deep neural network modules and create dumb sensors by means of a camera which captures 30 frames per second. These pictures are translated into pixels, and his job is to help the car figure out the meaning of these pixels. He is using terms like DNNs and CNNS as well as non-linear transformations using high level data to decipher exact architectural shape. He then says he uses the same algorithms to pick up trends, and that is how the artificial software he developed lead to the creation and success of the TAI Robotic Trend Indicator. In reality this software has nothing to do with AI and Knect is a paid actor. We are witnessing the usual hype only this time with a geeky and incoherent twist. Namely hyped up and exaggerated claims of easy money, fake testimonials, the use of actors, inflated bank accounts, and out right lies and fabrications. And the software has nothing to do with Forex, our trading dashboard shows binary options brokers as the image bellow illustrates. Absolutely not, so you had better get ready to part with at least $250 or whatever the minimum deposit amount which is accepted by the crooked Forex broker they choose for you. This money will be charged to your credit card, and you can kiss it goodbye. We are seeing a lot of those, so be mindful and super cautious. It’s well known that many so called “ethical review sites” receive bribes in the form of commissions for promoting fraudulent software. If you are not sure just ask us and we shall be more than happy to assist. If you are not quite sure about how to proceed and find yourself to be a bit hesitant, that is totally normal. Our staff of dedicated researchers has compiled a short list of the best and most consistent money-making apps available online today. These are all proudly displayed in our recommended section. 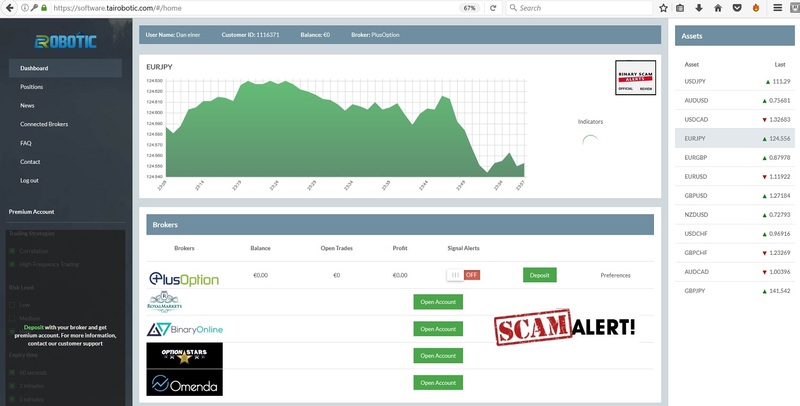 The TAI Robotic Forex Software and indicator by “John Doe” and Alex Knect is a BLACKLISTED SCAM. This is a confirmed fact and can’t be denied or disputed by any normal and logical human being. The narrative is so riddled with holes and inconsistencies that it’s even hard to follow or even relate to Knect even on the most simple terms. He is a horrible actor and the people who wrote the script for this sales video went too far and the message is incoherent, but also deceptive, misleading, and manipulative once you begin to understand what they want from you. We honestly tried, but could not find anything remotely resembling a legit or genuine app. So unfortunately we are forced once again to blacklist TAI Robotic and recommend our members and subscribers find alternative investment avenues. To get informed and updated about new scams simply join our Facebook page and Subscribe to our YouTube Channel.